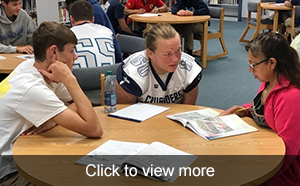 The students at Grand Island Central Catholic have a challenge to give volunteer time each school year in an effort to grow their own character in mind, body, and spirit. Catholic education is based on the teachings and actions of Jesus Christ who lived a life of selfless service to others. We believe that in giving of themselves, our students will grow closer to their families, friends, community, people in need, and ultimately to Jesus Christ and a Catholic lifestyle. April 30 was our all-school service day when students and staff made an impact at multiple communities, church, and school locations. 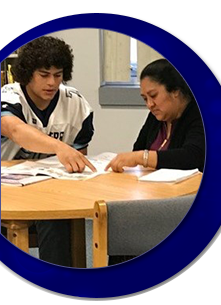 Our high school students have created a partnership with the Literacy Council of Grand Island to help with one-on-one English language tutoring. Just like the Literacy Council’s motto: Teaching People Transforming Lives; our students are proud to provide help that will enable our neighbors to be successful in our community by learning, growing, and understanding new language skills. Tracy Noble, one of the Literacy Council board of directors, said of the GICC students, “I am seeing some amazing things happen, and I feel strongly about this program. Both Literacy Council students and GICC students should be commended. The GICC students are much more engaging, I hear laughter, and I see persistence from both sides as well. I feel everyone is opening their hearts a bit more each time.